CHETUMAL, Quintana Roo-- The day after we arrived in Mexico City from our Boston vacation, we were sent out to cover the Category 5 Hurricane Dean, which was about to hit near the Cancun area. Without a chance to recover from jetlag from our previous flight, we were back at the Mexico City airport (our second home). We flew into Cancun and then drove along the Mexican coast the next day. The big concern, especially from the U.S. media was that Cancun and its multimillion dollar resorts would be destroyed, but Hurricane Dean moved further south, near the Belize border, and all the luxury of Cancun's main strip was spared. 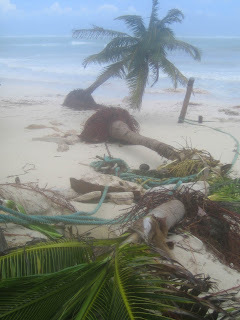 But since no one lost millions, the media spotlight on Hurricane Dean dimmed and left in the shadows were the real people who were affected-- the indigenous Mayan communities along the coast. On our drive to the port city of Chetumal, just minutes from Belize, we drove down what they call the Zona Maya. The road was dotted by thatched roofs that had been blasted by Dean. People sat under the skeletons of what used to be their homes. Others scrambled for some kind of makeshift shelter as rains from Dean's aftermath began pouring. With so much that foreigners have invested in the Cancun area, I think no matter what happens, it will always be rebuilt. But for towns like Chetumal, and other communities in the Mayan Zone, a tragedy like this could affect their very livelihood.